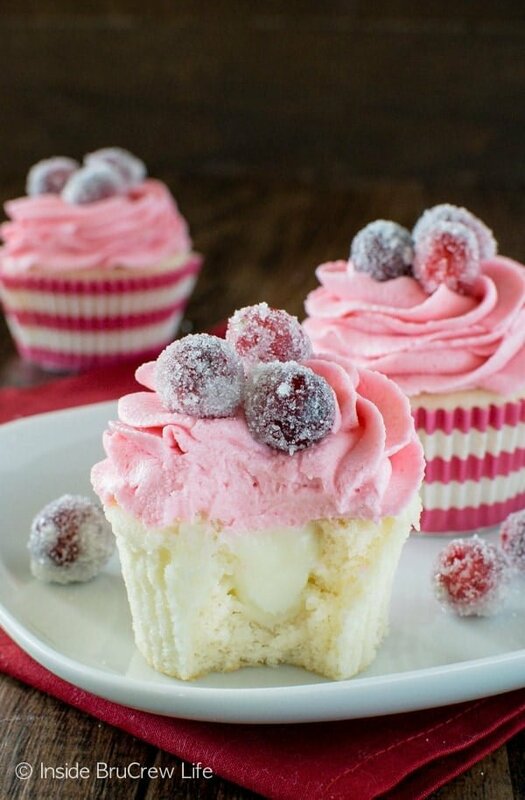 A hidden chocolate center and fresh berry frosting adds a delicious finish to these Sparkling Cranberry White Chocolate Cupcakes. Years and years ago I took a cake decorating class with a friend. I was 7 months pregnant at the time, so I’m really not sure what possessed me to waddle into this class. Somewhere along the way I decided that having kids meant I was going to need to make fun birthday cakes every year. So I had to learn sometime. I learned some easy decorating tips in that first 4 week class, but most of what I have learned about cakes and frosting has been by trial and error. Frosting is really pretty forgiving. If you mess up, you can just scrape it off and start over. That’s probably part of the reason I gave up my home-based cake business. The perfectionist in me was taking hours upon hours to finish cakes or cupcakes for my clients. I have found that baking for my internet friends is much more relaxing. Plus, these baked goods stay in my kitchen. There is no added stress of hoping the finished product did not get dropped on the car ride to their house. 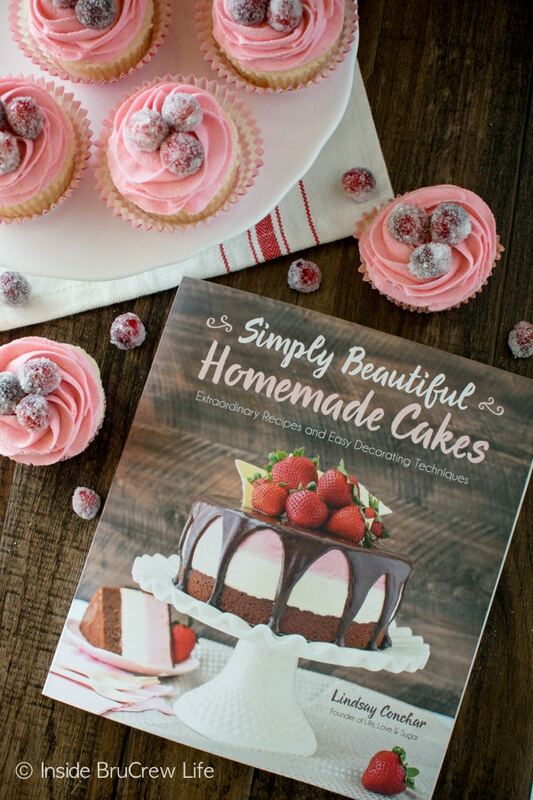 If you have never decorated a cake or cupcakes before, I have a great resource for you today. These gorgeous cupcakes came from my good friend Lindsay’s book Simply Beautiful Homemade Cakes. Lindsay is an absolute doll. She is seriously one of the sweetest and kindest people you will meet. I have had the opportunity to meet her a few times, and I just love chatting with her. And her photography on her blog, Life, Love, & Sugar, blows me away every.single.time!!!!! I seriously just sit there and drool over the gorgeous photos that she takes! 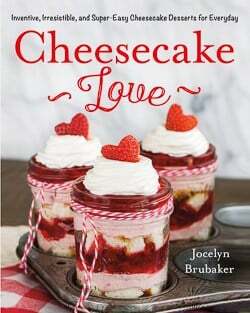 When I heard she was writing a cookbook, I just knew it would be fantastic. And her book didn’t disappoint me. The entire book is filled with pretty pictures of the finished products and pictures of how to make it get there. I love all the detailed photos showing you how to apply decorations. As I flipped through the book, I was having a hard time deciding what to make. I mean, I wanted everything! 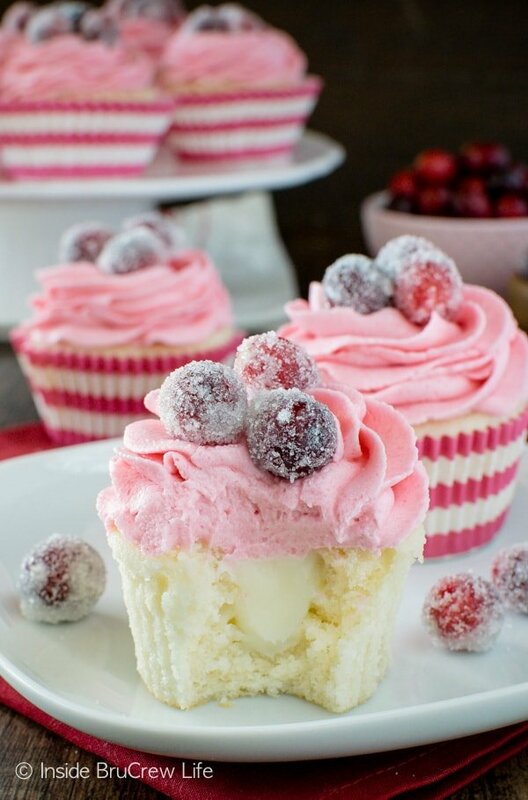 But as soon as I saw these sparkling cranberry white chocolate cupcakes, I knew these were the ones. Filled cupcakes are one my favorite things to make. 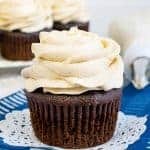 These chocolate pumpkin cream filled cupcakes and these lemon coconut cupcakes are two of my favorites from this year. There is just something so fun about biting into a soft cupcake and finding that hidden center! 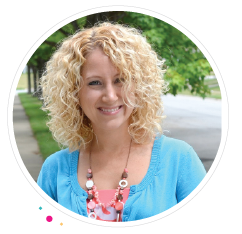 Almost everything in Lindsay’s book is homemade, so make sure you set aside enough time to make your treats. But don’t worry about it because her book will walk you through every step and show you how to achieve that pretty dessert. Make your sugar covered cranberries the night before. They need time to soak in the sugar syrup. As you start rolling them in sugar, just use a little sugar at a time. The sugar will start to get clumps from the syrup on the berries. Bake and cool your cupcakes. Make sure to test your cupcakes as you bake them. I did 12 cupcakes and it took them 20 minutes in my oven. 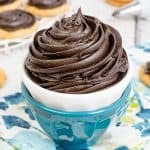 Once cool, use a cupcake corer to remove the centers because we need room for the creamy center. Let the white chocolate ganache set up before filling the cupcakes. If you add it too soon, it will soak into the cupcakes. It should still be soft, but not runny. Cook the cranberries in a little bit of water until they pop. Puree the mixture and press it through a fine mesh sieve to remove the peels. 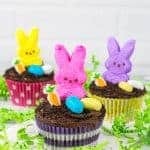 Assemble the cupcakes and share with friends and family! Stir together the water and 1/2 cup sugar in a small saucepan. Simmer until the sugar is completely dissolved. Pour the syrup into a bowl and cool for about 10 minutes. Add the cranberries and stir to coat. Refrigerate the cranberries and syrup overnight, stirring a couple times to coat with syrup. Preheat the oven to 350 degrees. Place 12 cupcake liners in a cupcake pan. Cream the butter and sugar until light in color and fluffy, about 3-4 minutes. Add the extracts and sour cream and mix until well combined. Add 1 of the egg whites and mix until combined. Add the remaining 2 egg whites and mix again. Scrape down the sides of the bowl often, if needed. Combine the flour and baking powder. Add half the flour mixture and half the milk and mix until integrated. Add the rest of the flour and milk and mix until combined. Fill the cupcake liners with the batter. Bake for 18-20 minutes, or until a toothpick inserted in the center comes out mostly clean. 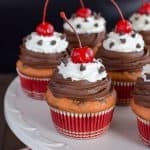 Remove the cupcakes and allow them to cool 2-3 minutes in the pan, then remove them from the pan and place on a cooling rack to finish cooling. To finish the cranberries, remove them from the syrup and roll them in the remaining sugar. Add a little bit of sugar at a time, as it will get clumps. Set the cranberries aside to dry for an hour or so. Combine the cranberries, water, and sugar in a small saucepan and cook over medium-high heat for about 5-7 minutes, or until the cranberries begin to pop. Remove from the heat and set aside to cool for about 5 minutes. Place the cranberries in a food processor and puree. Strain the mixture through a fine mesh sieve. Beat the butter, shortening, and salt in a mixing bowl until smooth. Slowly add 1 1/2 cups sugar and mix until smooth. Add 1/4 cup cranberry puree and mix until well combined. Add the remaining sugar and beat until smooth and creamy. Place the white chocolate chips and heavy cream in a microwave safe bowl. Heat for 30 seconds. Stir and heat for another 20-30 seconds. Stir and let sit for a few minutes. Stir until melted and creamy. Set aside to cool and thicken. 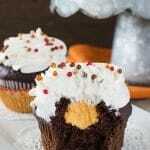 Use a cupcake corer to remove the centers of the cupcakes. Spoon the thickened white chocolate into the centers. 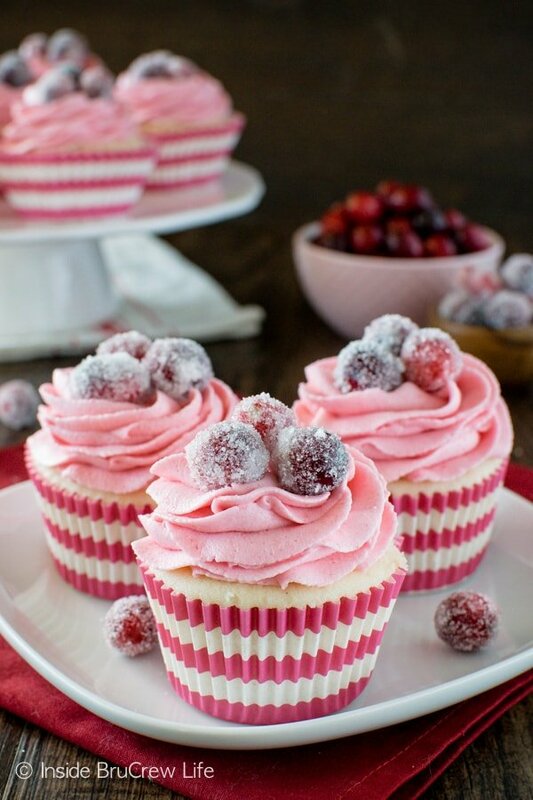 Frost the cupcakes with the cranberry frosting using a piping bag and large piping tip. 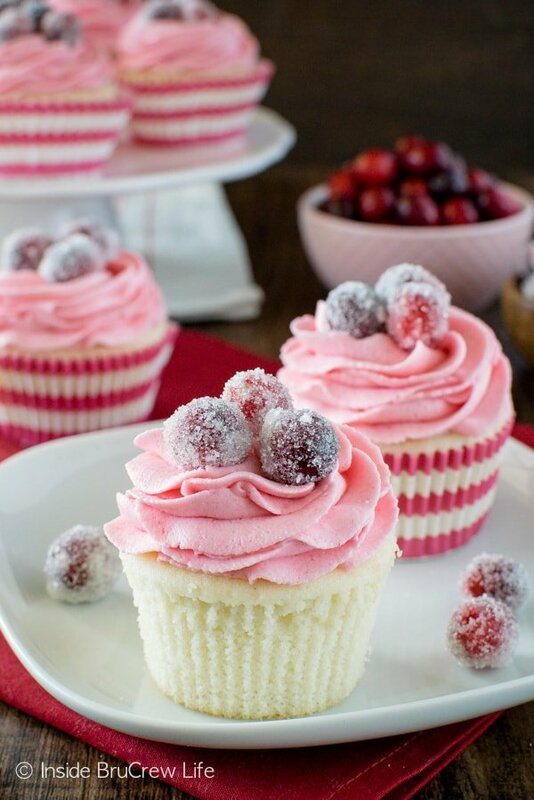 Top each cupcake with a few sugared cranberries. Makes 12 cupcakes. Store on the counter in a sealed container for 2-3 days. *This post contains affiliate links. Inside BruCrew Life receives a very small percentage from sales made through these links. Thank you for supporting us and letting us share products we love. Jocelyn, these are SO GORGEOUS! Seriously perfect! I’m in love! Thank you so much for sharing them! And I totally hear you – decorating for internet friends is the way to go! 🙂 Plus, I’ve gotten to meet new friends like you – yay! These are seriously the prettiest cupcakes ever! I can’t think of a better combination than cranberries and white chocolate, not only festive, but so delicious! GORGEOUS cupcakes! Can’t wait to make this recipe. Thanks for sharing! 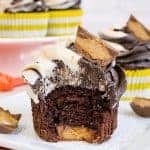 Question: Do you top the ganache filling with some of the cupcake core you removed or do you ice directly on top of the ganache? These look beautiful! I am excited to try them. I do have one question. I can’t seem to find the note for how much sugar to boil with the water to make the syrup. The ingredients list says 3/4 cup sugar, divided. But how much do I boil with the water and how much do I reserve for rolling the cranberries? Thanks! Oh, my goodness. Thank you so much for letting me know that I missed that little detail in the recipe. You use 1/2 cup of the sugar for the syrup and roll in the remaining. I fixed the recipe too 🙂 I hope you enjoy the cupcakes!! When making the frosting, are we supposed to use white or powdered sugar? Most frostings are made with powdered sugar but the recipe doesn’t specify. I just made it with white sugar and it does not taste like frosting at all! If you continue reading the ingredient list you will see 3 cups of powdered sugar that you use in the frosting. The regular sugar is for coating the cranberries in which is described in the recipe as well. I hope that helps. Ugh. How did I miss that?!! I’ve made it now with the correct sugar. Delicious and beautiful!! I’m glad you were able to redo the frosting and enjoy the cupcakes! After they are made can they be put in the fridge overnight? Will the frosting stay ok? You can refrigerate them if you want too, but they don’t need to be if you are eating them within 2-3 days. I hope you enjoy them!